The world’s most successful and best – selling soprano, Sarah Brightman, returns to London for the first time since her Harem World Tour in 2004. 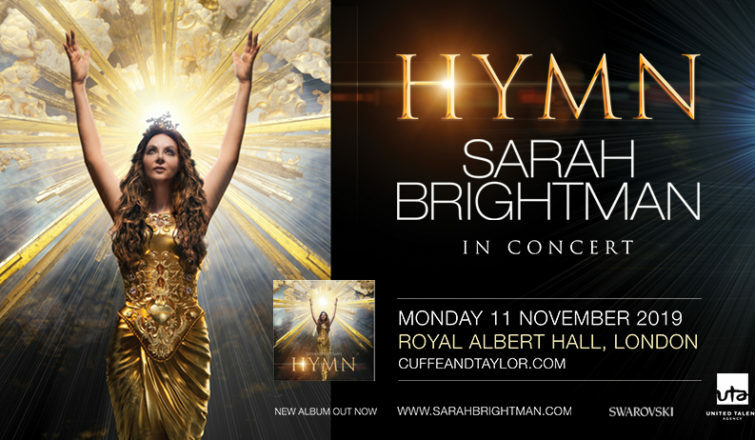 Her new world tour, HYMN: Sarah Brightman In Concert will come to Royal Albert Hall, Monday 11th November, for one night only. One of the UK’s greatest global stars, the Berkhamsted born singer says fans should, “expect the unexpected!”. Brightman began her HYMN world tour in South America in November 2018 and includes 125 shows across five continents throughout 2019. On coming home to perform, Sarah says, “It’s been a long time since I performed in London and I’m so excited to bring this beautiful new show back home to you and perform new songs and of course many favourites. To me, HYMN suggests joy and a feeling of hope and light – something familiar and secure, like home”. Sarah last headlined the Royal Albert Hall over 20 years ago, in 1997 and is returning for a very special night, accompanied by her band, a full orchestra, choir and special guests to be announced in the coming months. Sarah Brightman unveiled her much-anticipated fifteenth full-length album, HYMN, on November 9, 2018 (Decca Gold/ Universal Music Group). This marks the multiplatinum GRAMMY® award – nominated classical crossover pioneer’s first new studio recording since she released the international chart-topper Dreamchaser in 2013. About Sarah Brightman: Known for her three -octave range and for pioneering the classical – crossover music movement, Sarah Brightman has amassed global sales of more than 30 million units. The only artist to have simultaneously topped Billboard’s dance and classical music charts, Brightman has racked up more than 180 gold and platinum awards in over 40 countries. She is also known for her iconic star turn in The Phantom of the Opera, whose soundtrack has sold more than 40 million copies worldwide. Her duet with Bocelli, “Time To Say Goodbye,” became an international success selling 12 million copies world wide. Brightman’s albums Eden, La Luna, Harem, and Symphony were each chart – topping Billboard hits and accompanied by world tours. Additionally, Brightman has performed at such prestigious events as the 2007 Concert for Diana, the 1992 Barcelona Olympic Games and the 2008 Beijing Olympic Games. Brightman returned to the recording studio in 2016 to begin working on HYMN with long time producer and collaborator Frank Peterson who notably helmed production on eight seminal recordings by the artist, including Dive , Fly , Timeless (Time To Say Goodbye) , Eden , La Luna , Harem , and Symphony and Winter Symphony . Album closes with a new rendition of Brightman’s signature smash duet with Andrea Bocelli, “Time To Say Goodbye,” singing lyrics that she wrote herself, and sung in English for the first time.